Sometimes life throws some major changes your way and you have to remember one thing: Don’t Panic. 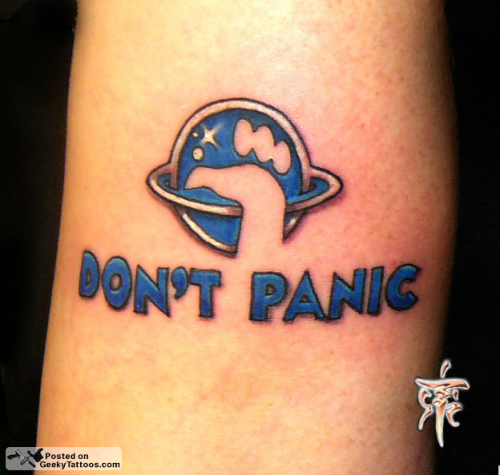 After going through a nasty breakup, moving across the state, and going back to school, MJ felt she needed a permanent reminder of this mantra so she got Tony at Gus’s Tattoo Studio to ink the Hitchhiker’s Guide advice on her forearm. Tagged with forearm, Gus's Tattoo Studio, Hitchhiker's Guide to the Galaxy. MJ is not a guy! Not a worry at all! My nickname is hella androgynous, still I often forget! Thank you so much for updating!